Mary at her Annunciation models faith for us. She shows us that faith is more than assent, but is also trust, commitment, obedience, and submission. Mary trusted in God’s promises, was obedient to God’s word of invitation in her life, surrendered to the mystery before her, and committed herself to be part of God’s plan of salvation in Jesus. At the same time, we can easily romanticize the Gospel scene—Mary is at prayer, an angel appears, and she says a faith-filled yes. The Scripture also tells us that she was deeply troubled and wondered what the angel’s greeting meant. Certainly the angel’s explanation only left her with more questions and concerns. She did not say yes because she fully understood or had all her questions answered. She said yes in faith and trust. We do Mary a disservice to think she had some infused knowledge that dispelled all her doubts. She was a young woman of extraordinary faith. 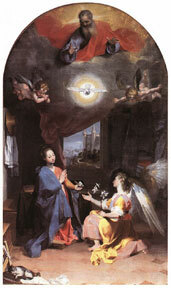 The “yes” at the Annunciation was not the first “yes” in her life nor would it be the last. The really significant yeses in our lives also demand a great deal of trust and openness. We cannot know all the implications of them. We respond to the gift of God’s call in our lives. We say yes in hope and trust. Like Mary, we say “yes” to something being born in us that must grow and mature and take a shape we cannot predict. We are called to that depth of faith as we contemplate the story of the Annunciation and all the stories of the life of Jesus in the rest of the [Spiritual] Exercises. We are called to trust, obedience, surrender, and commitment in our own lives. 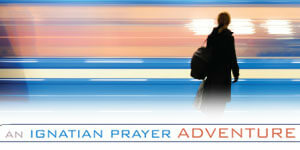 We will hear an invitation to share in the work of Jesus and respond and live in faith. Wadell feels we need these narratives “to mold and shape us, especially in the attitudes and virtues of Jesus.” Ignatian imaginative prayer on the Gospel stories is a powerful way to grow in faith by putting on the heart of Christ. As Jesus trusted, obeyed, surrendered, and committed his life to the Father, we are to respond in the same way. All the contemplations on the Gospels throughout the Exercises foster growth in the virtue of faith that empowers us to trust God and commit ourselves to service. Excerpt from Putting on the Heart of Christ: How the Spiritual Exercises Invite Us to a Virtuous Life by Gerald M. Fagin, SJ.